Science and folk tradition are supposed to be strictly separate domains of knowledge, but in practice they often shade into each other. 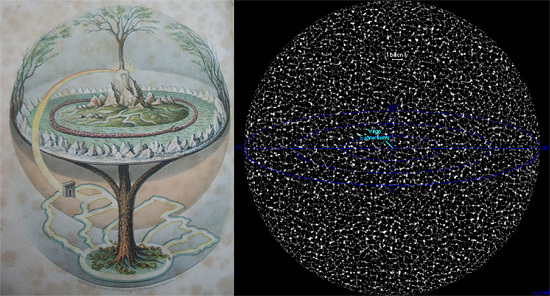 The image shown above right attempts to map the entire visible universe. The galaxies tend to collect into vast sheets and superclusters of galaxies surrounding large voids giving the universe a cellular appearance. Since the Enlightenment, people have made a fairly rigid distinction between ideas about the cosmos as formulated by individual thinkers, on a rational basis, and those as expressed collectively by entire peoples, typically rooted in folk memory. The former are labelled science, theory of nature or cosmology, the latter traditional cosmology or mythology. The theoretical difference between scientific and traditional paradigms of the cosmos certainly cannot be overemphasised. Whereas the former continuously reinvent themselves in response to the latest insights, the latter are conservative by nature. The former fundamentally look forward as they evolve, the latter look backward as they decay. And whereas the former do not tolerate logical inconsistencies, the latter happily admit them. Nevertheless, it is equally paramount to recognise the ultimate continuity between concepts that circulate between traditional lore and science. The collection of ideas about the cosmos, whether scholarly or popular, deserves a single denominator, as the same subject matter is involved. With the possible exception of cosmovision, an expression thriving especially in the Spanish-speaking world, cosmology really presents itself as the most suitable term for any sets of ideas about the world. Modern cosmology, taking its earliest beginnings in the proto-scientific speculations of Greek philosophers, contrasts with traditional cosmology as it has prevailed among people through all ages and cultures. Although the gap between scientific and traditional cosmology is wide and radical in theory, it is considerably smaller in practice, for two reasons. On one hand, cultures perpetuating traditional lore would always incorporate practical observations of nature into their cosmologies, gradually modifying the latter over time. Whilst some might do so unconsciously, believing to remain faithful in the transmission of ideas, others take pride in deliberately ‘upgrading’ or actualising knowledge handed down by their ancestors. Accordingly, traditional cosmologies are never composed of ‘pure’ tradition alone, but always comprise a mixture of inherited ideas and recent observations. So do scientific cosmologies, for, on the other hand, even the most sincere thinkers remain human beings, susceptible to the same psychological and sociological influences as those that control other aspects of society, such as politics, commerce and religion. Science and scholarship routinely fall short of their aspirations and accommodate logical contradictions, for a variety of reasons. In addition, intransigence, uncritical loyalty to authorities and tendentious or fashionable modes of reasoning – such as a blind belief in unfettered mathematical derivation – are three types of ‘tradition’-forming behaviour that are rife in the world of professional researchers. New ideas are resisted as much as welcomed – and for the wrong reasons. In excessive cases, such as the ‘Big Bang’ theory of the origin of the cosmos or the reliability of radioactive dating methods, scientific tradition has become so ingrained that the academic community acts in a manner more characteristic of a political or a religious group than a scientific one. The intermixture of science and uncritical tradition is a stupefying, even lethal combination. Yet science’s marked tendency to develop inviolable traditions and ultimately degenerate into an edifice of myth decorated with fripperies of elegant nomenclature or mathematics may well be rooted in an innate, evolutionary process of habit-forming. Perhaps the central aim of science, to expose the structure and the workings of the world in a perfectly rational and impartial manner, runs counter to mankind’s hardwired psychological inclinations. The ‘unnatural’ character of the endeavour, from a biological point of view, is precisely why pure science is so hard to do. The challenge that confronts us now is to return to an imaginative, courageous yet highly critical mindset such as was pioneered during the Enlightenment. Is it possible to reduce contamination of science with sociopolitical factors – such as prestige, sensationalism, the flow of money, fear of ridicule, religious inspiration or quantity of output – to a minimum, to denude science of its capitalist and popularist cloaks and to overcome the crippling syndrome of the ‘emperor’s new clothes’? Among the many benefits this would yield, one would be a better understanding of the past. For clearly, the true origins of the world’s traditional cosmologies – which run into the thousands – can only be approximated if these cosmologies are distanced from scientific cosmology – the myth must be taken out of today’s science in order to find the science in the myth.